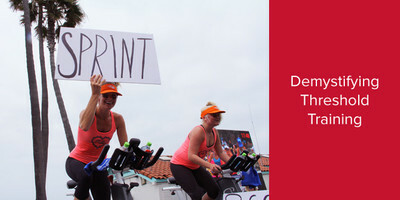 Remember the last time that you took a Spinning® class in the Interval, Race Day or Strength Energy Zones™. Those high-intensity, short duration bouts of activity—ranging between 10 seconds to several minutes—instigate the accumulation of blood lactate (notice I didn’t say lactic acid) within the muscles, causing acute soreness and “burn.” Lactate threshold (LT), expressed as a percent of your VO2max, is the point at which the body produces more lactate in the muscles than it removes from the muscles. Remember, VO2max is your maximal oxygen consumption; a fitter person has a higher VO2max than a deconditioned person. We can “feel” the lactate in our muscles and, consequently, our performance diminishes. During exercise, lactate will diminish performance, and the goal is to perform at a higher percentage of VO2max while keeping lactate levels below or just slightly above threshold. Lactate is not the same as lactic acid. Lactic acid is a by-product of glycolysis, which is an anaerobic energy system—the system that uses glucose as currency to produce ATP/energy. Lactic acid is an unstable compound and dissociates very quickly, releasing acidic hydrogen ions into the blood and the remaining compound combines with a sodium or potassium ion to create lactate—a salt that blunts performance. In addition, the “rogue” hydrogen ions adversely affect the respiratory system as well. Therefore, to keep blood lactate levels under control, we need to use fat as the primary fuel as long as possible, and we need to train at or slightly above threshold to improve the muscles’ ability to tolerate an acidic environment (i.e. buffer the acid). In other words, anaerobic training is the only way to improve buffering capacity and, in conjunction, improve aerobic power and speed endurance. How can we determine our lactate threshold? Lactate threshold is determined by measuring blood lactate concentrations during exercise (via a blood sample). A concentration of about 4mmol/L typically reflects threshold in most trained individuals. Obviously, measuring blood lactate is not feasible for most athletes, let alone regular fitness enthusiasts. However, under most conditions, an anaerobic threshold (AT) test can be used as a noninvasive method to estimate lactate threshold. 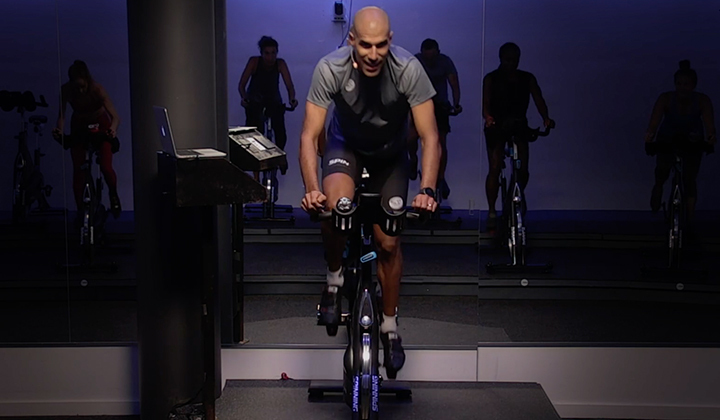 This test involves a graded test on a treadmill or cycle ergometer. Keep in mind, LT and AT are not the same thing. Anaerobic threshold is the point when the metabolic demands of aerobic exercise can no longer be met. It can be identified as a specific intensity. 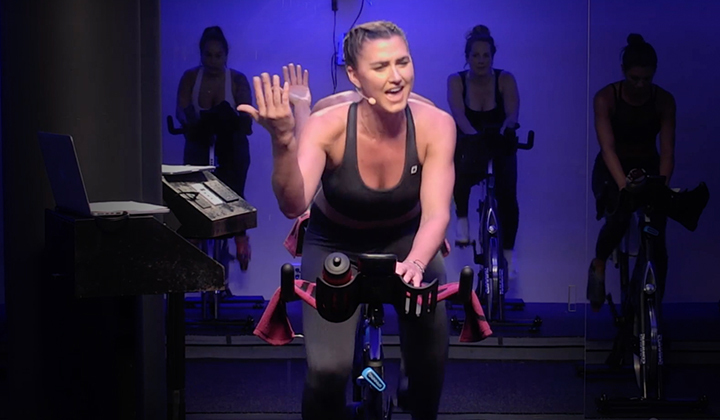 As a result, the demands for oxygen increase and the body urgently tries to clear excess carbon dioxide—we know this is happening because we are out of breath!By performing a basic field test on a Spinner® bike, you can determine your heart rate at your AT. Knowing this number allows you to perform threshold training by working out slightly below to slightly above that heart rate.Test ProtocolTo perform this test, be sure you are fully rested, well hydrated, healthy and injury-free.You will also need a heart rate monitor with an average heart rate function, as well as a Spinner bike equipped with a Spinning® Computer. Warm up for 15 minutes—you need to be “primed” for what’s to come. 30 minute test begins. Hit the lap button and ride for 10 minutes at a cadence of 90 RPM. Find the right resistance so that the intensity feels moderate to vigorous. After 10 minutes (lap 1), hit the lap button again on your console or watch to start lap 2. You will be recording your average heart rate at the end of the final 20 minutes. 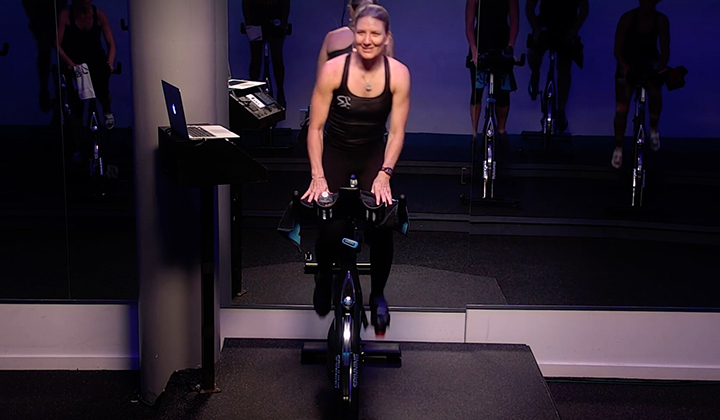 During the last 20 minutes add resistance every 2 minutes while keeping the cadence between 90-100 RPM. The intensity should feel vigorous to very vigorous. At the end of test, you should feel like you gave it your all. The average heart rate for the second lap is your approximate AT, which corresponds to your AT intensity. You can use this AT heart rate to determine training zones for threshold training, which will increase AT and improve lactic acid buffering. Threshold training can occur between 95–115% of AT heart rate. For example, if your AT heart rate is 185, aim for a heart rate range of 175–212 BPM. 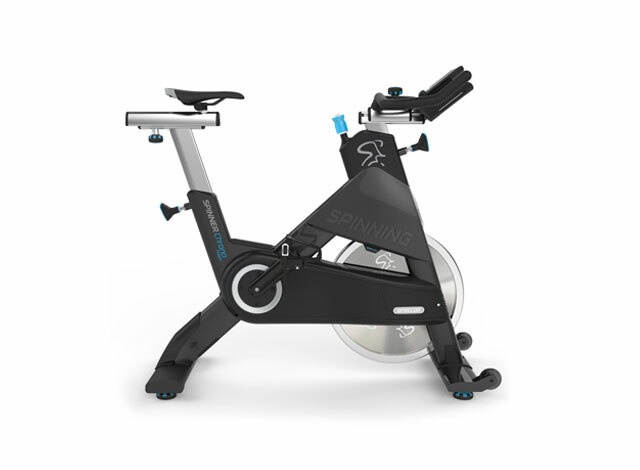 Threshold training can be an effective way to add a new stimulus to you Spinning® program. Bear in mind, periodization is key. A strong aerobic foundation must be developed before implementing lactate threshold training; some individuals need up to six months to develop an aerobic base. To avoid overtraining, threshold training should be performed 1–3 times per week. If you are training for a competitive event, the volume and dose-response may increase as competition day closes in, but adequate recovery—one to two days between AT trainings—is crucial for optimal performance.Looking for threshold training ride ideas? The Spinning Ridebook (volumes 1 and 2) contain creative profile designs for all Energy Zones.